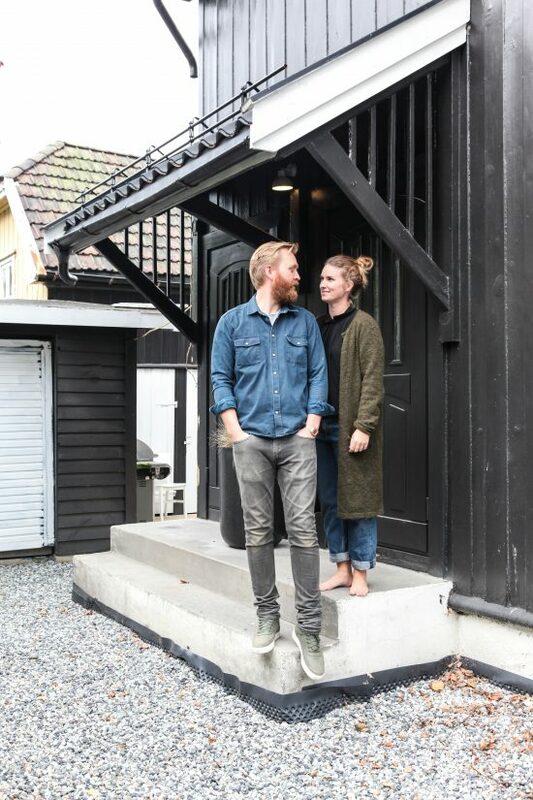 “We spent our twenties living in Oslo, but we are both originally from Drammen. We never thought we would move back home, not until we had our son and we suddenly we had someone else to think about besides ourselves. 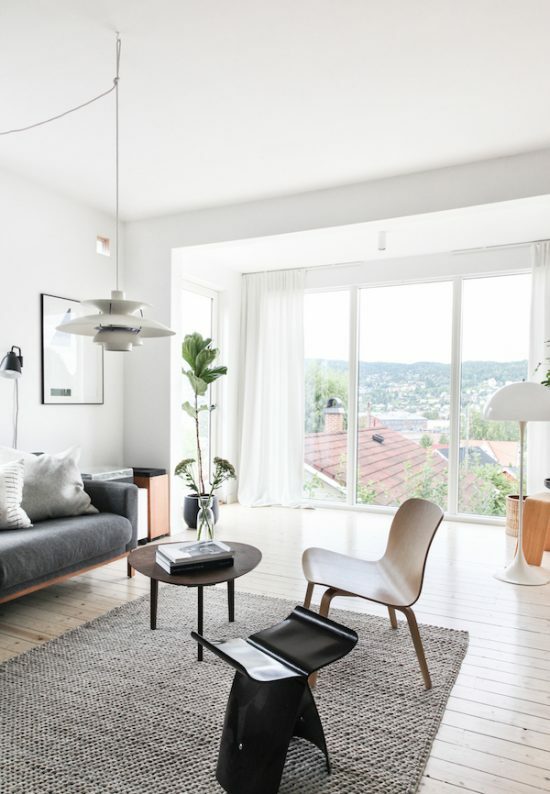 At the same time, Ask og Eng came into the works and having a space here in Drammen instead of Oslo made more sense logistically.” The couple made the leap and found a charming home overlooking Drammen suitable for family living, and just a stone’s throw from their studio space. 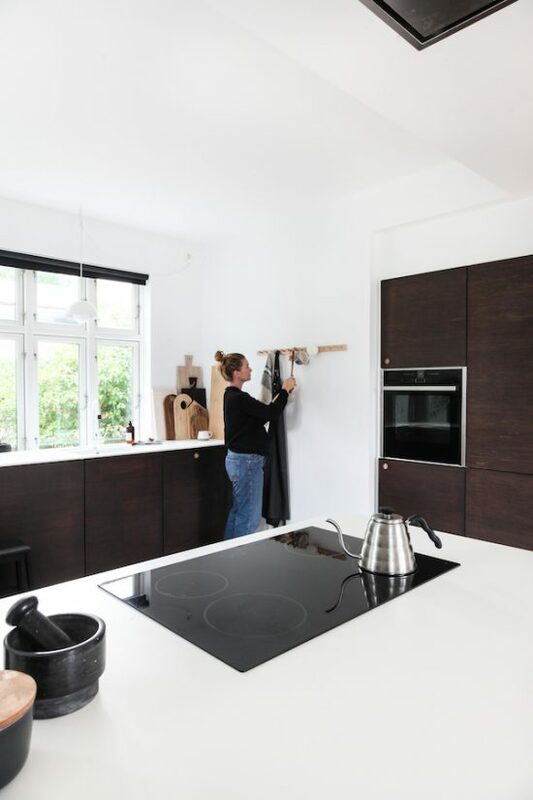 The husband-and-wife team founded their own company Ask og Eng in 2016, after noticing a gap in the market for beautiful and sustainable kitchens and furniture with bamboo as the primary material. 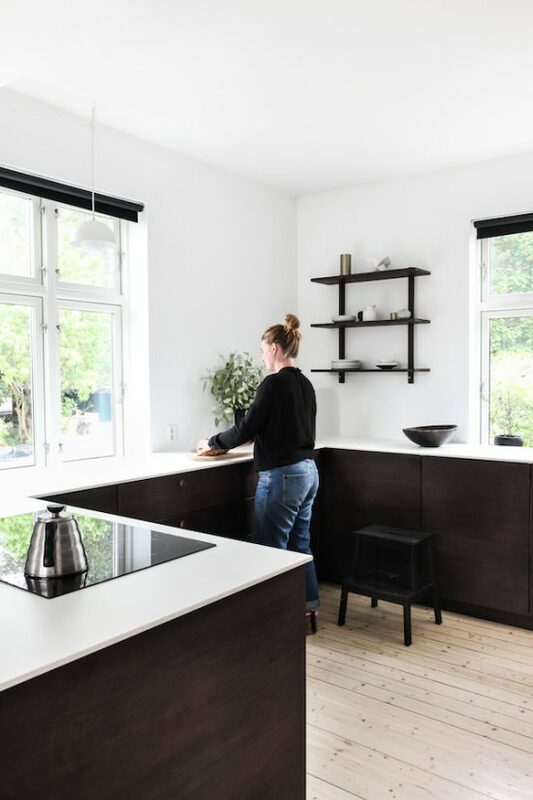 Kine’s background in environmental geography and climate change combines with Kristoffer’s background in architecture, resulting in a beautiful brand in which clever design, functionality and sustainability play a key role. 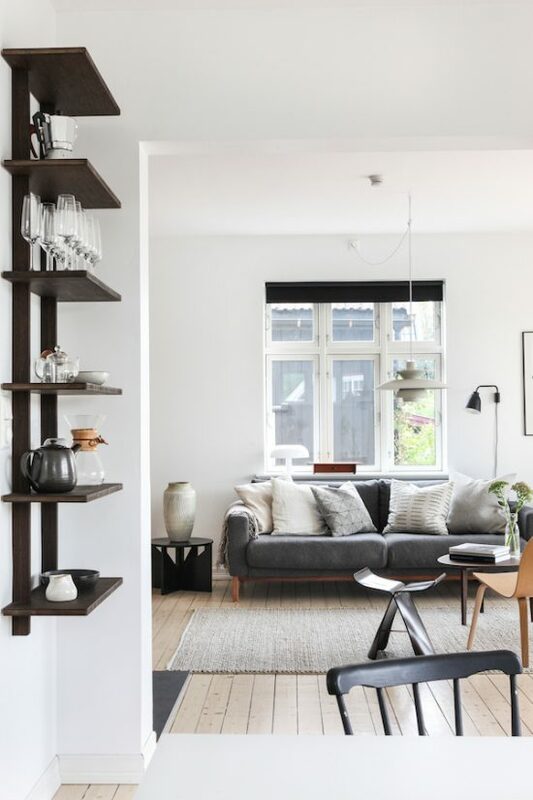 Bringing home their penchant for minimalism, quality and keen eye for detail, their spaces blend modest sophistication with a muted, warm palette. 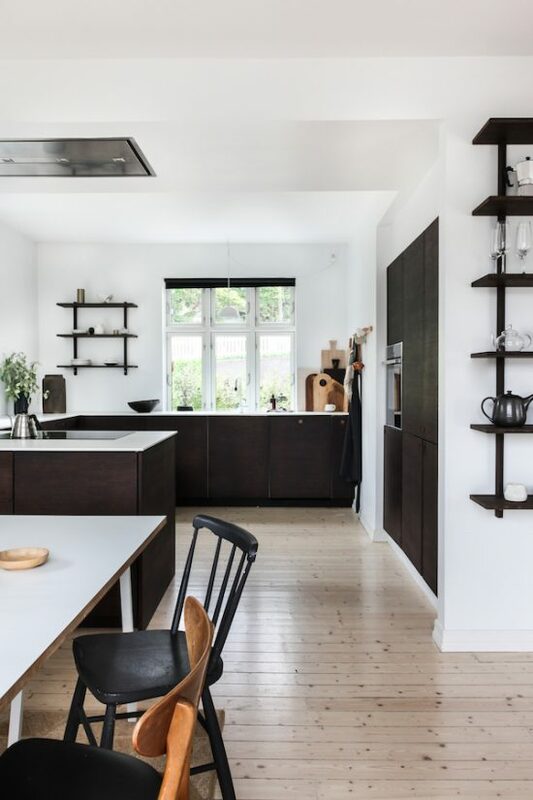 With an up-and-coming label specialising in bamboo kitchens and bespoke furniture, their own home has in many ways been their playground. 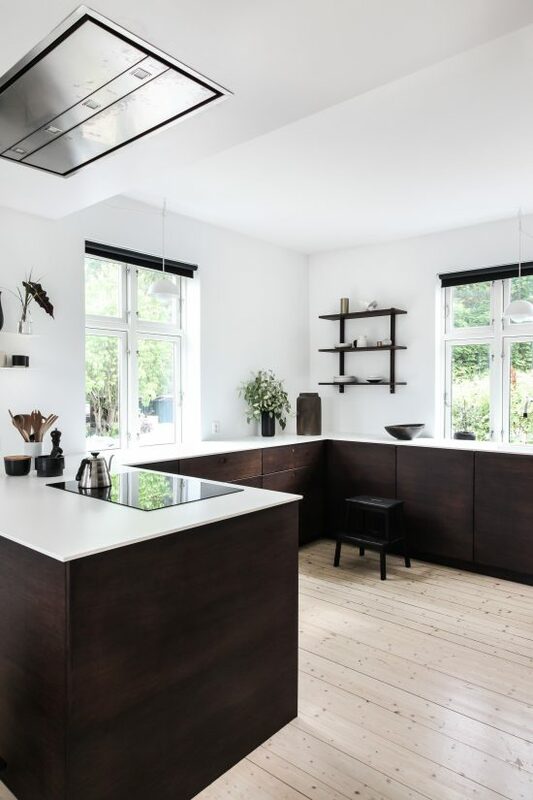 Their U-shaped kitchen was one of the first prototypes of their product, and was what inspired them to launch Ask og Eng. 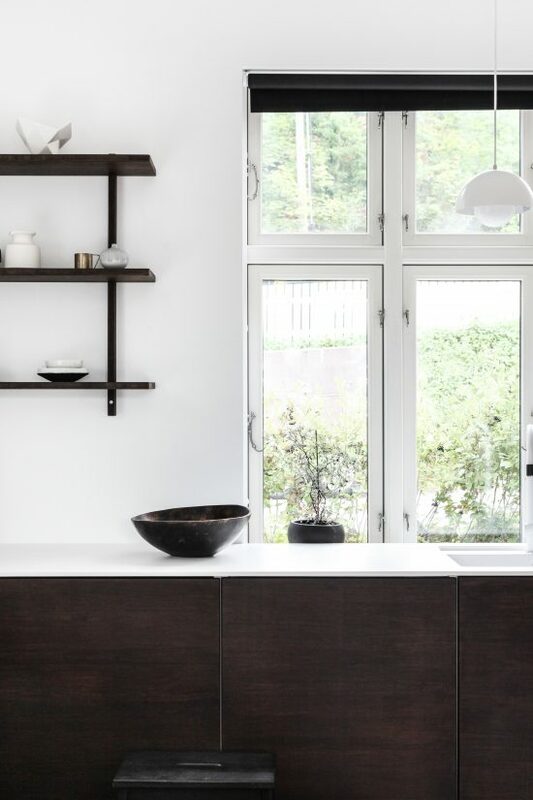 The ‘bean’ stained bamboo kitchen features simple door and drawer fronts with round indented pulls and a sleek white composite counter top. 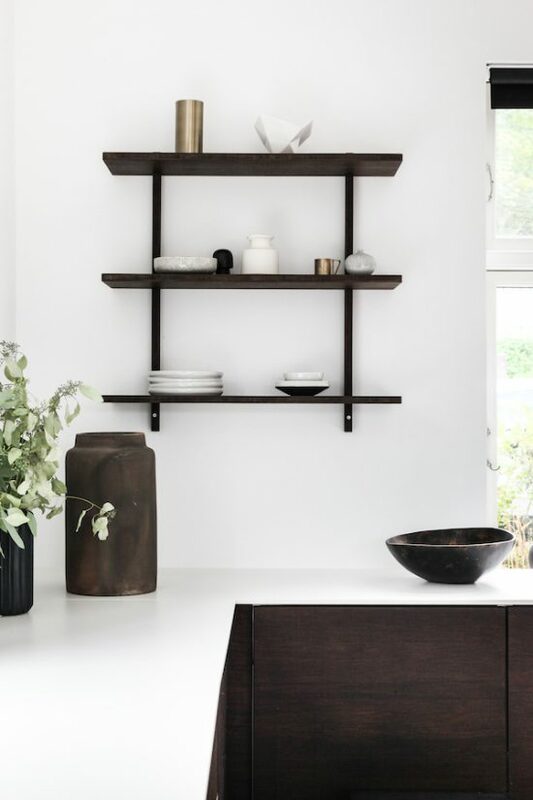 Kine has kept the walls free of upper cabinets, choosing to display her favourite kitchen accessories on understated wall mounted bamboo shelves, also a prototype from their own collection. 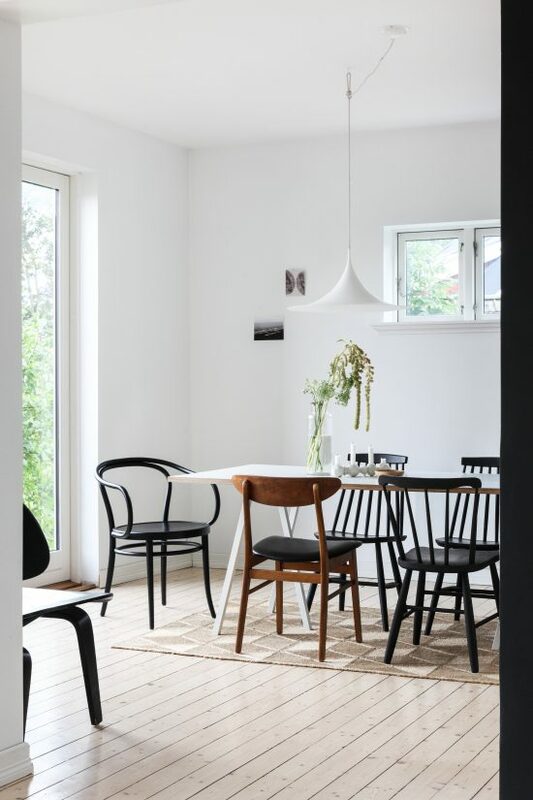 Around a sleek white table by Hay, an eclectic array of chairs – both contemporary as well as vintage design classics – create a playful dining area for the young family, while Kine and Kristoffer prefer to keep the walls free of colour to maximise the natural light the flows in from the floor-to-ceiling windows at the back of the property. 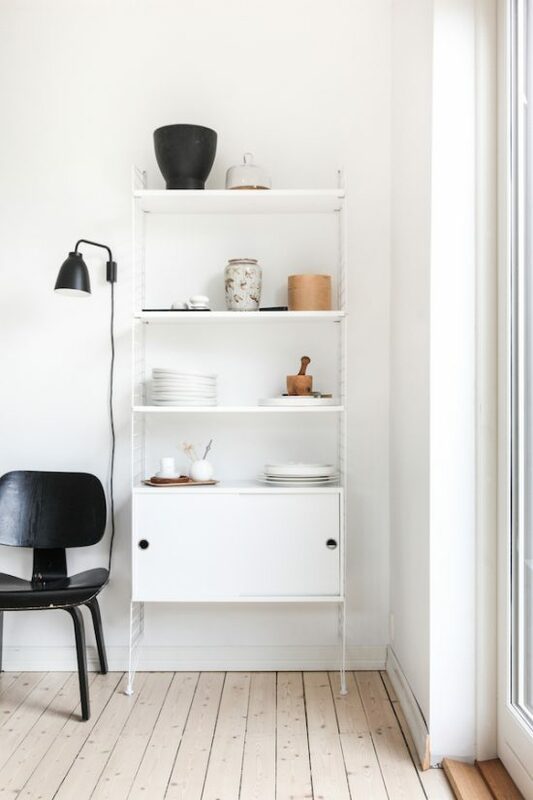 A white String system displays Kine’s favourite tableware, and when paired with a vintage Eames chair, creates one of many decorative ‘moments’ that Kine skilfully weaves throughout her home. 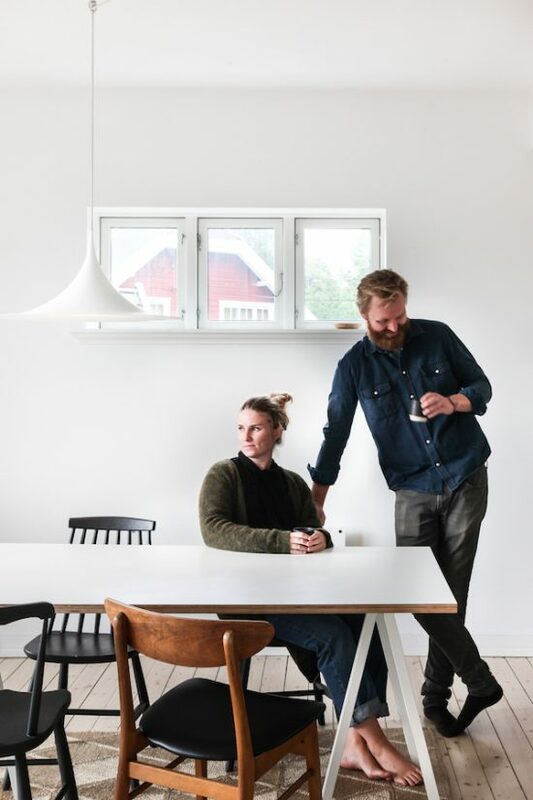 In their open plan living room, whitewashed pine wood floors and crisp white walls offer a clean backdrop upon which Kine and Kristoffer have layered in texture, various wood elements, a contrasting black wall surrounding the fireplace and a carefully curated variety of furniture and accessories. 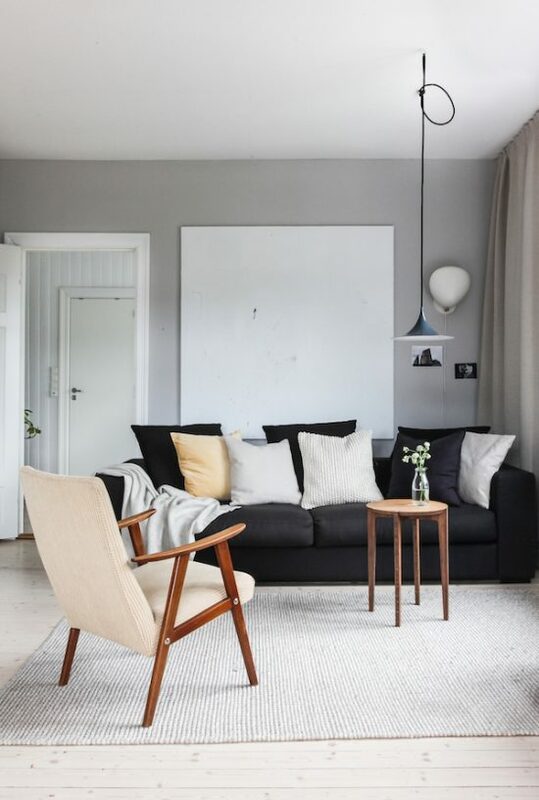 In their home, the various shades of grey, white and black offer a calming stage upon which this family of three (almost four) can truly relax and unwind. 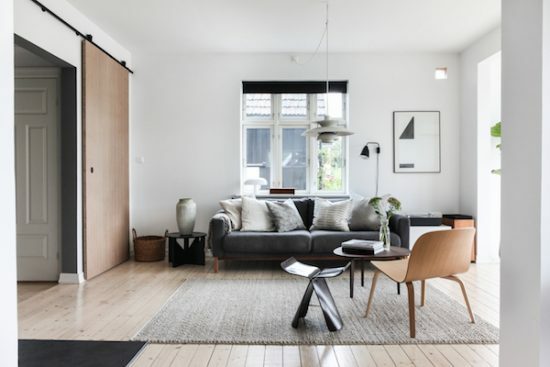 Their very own bamboo sliding door design, which separates the entry and living room, is in good company amid design classics such as Vitra’s butterfly stool and Louis Poulson lighting. Upstairs, the family enjoy a second family room, where movie nights and general relaxing take place. 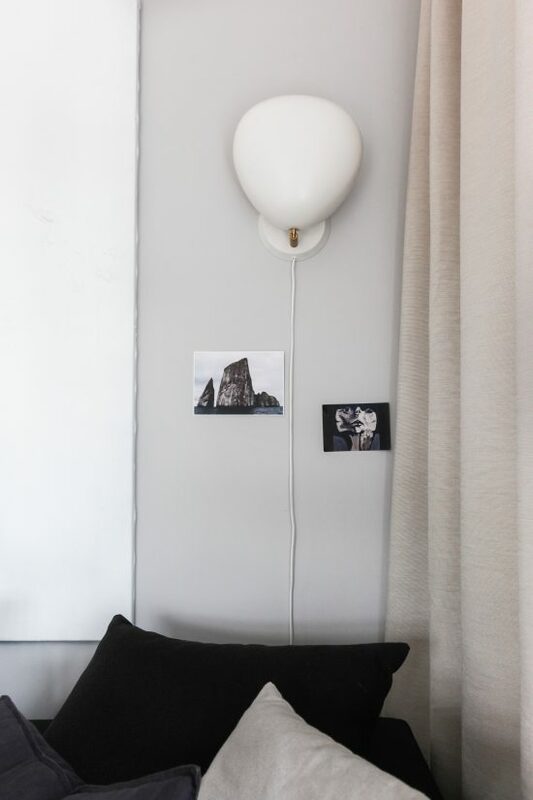 Here, the muted palette pairs effortlessly with contrasting black walls. 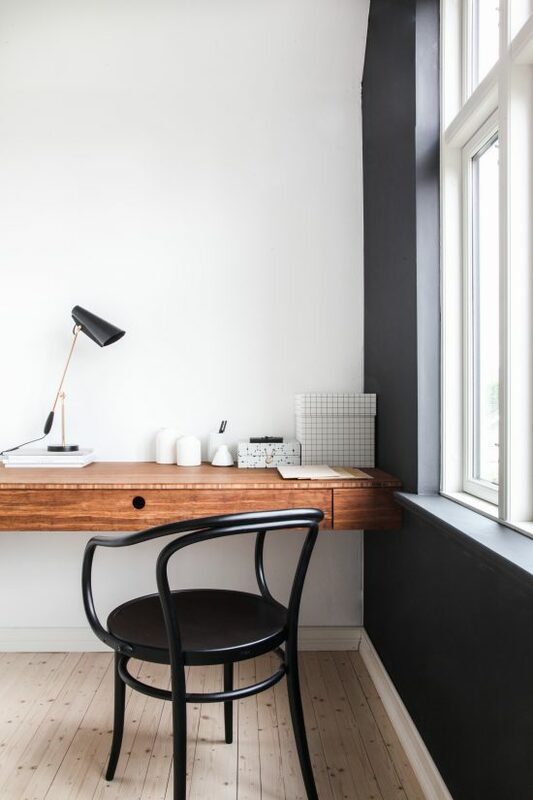 A small office nook flanking the windows offer Kine and Kristoffer a space to catch up on work when at home, featuring a floating bamboo desk and tranquil views over Drammen. 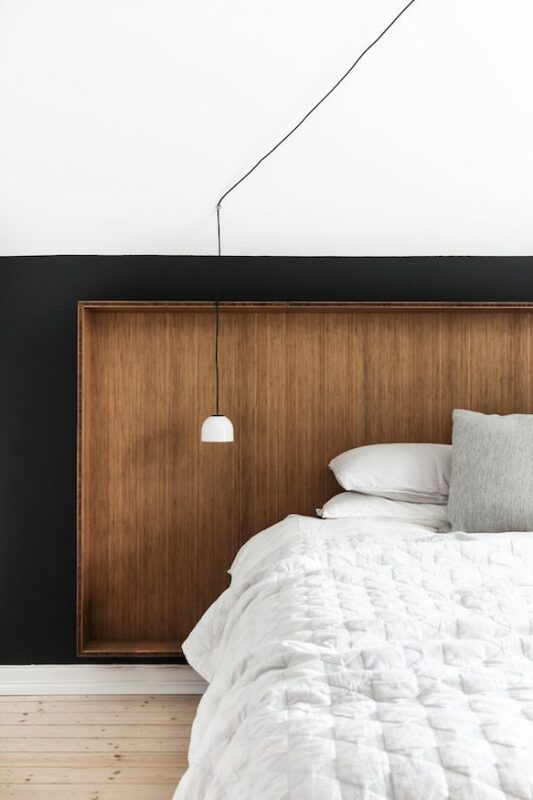 In an otherwise awkward space with slanted ceilings, Kine and Kristoffer cleverly fashioned a striking headboard out of bamboo, creating a master suite that is every bit as cosy as it is stylish. 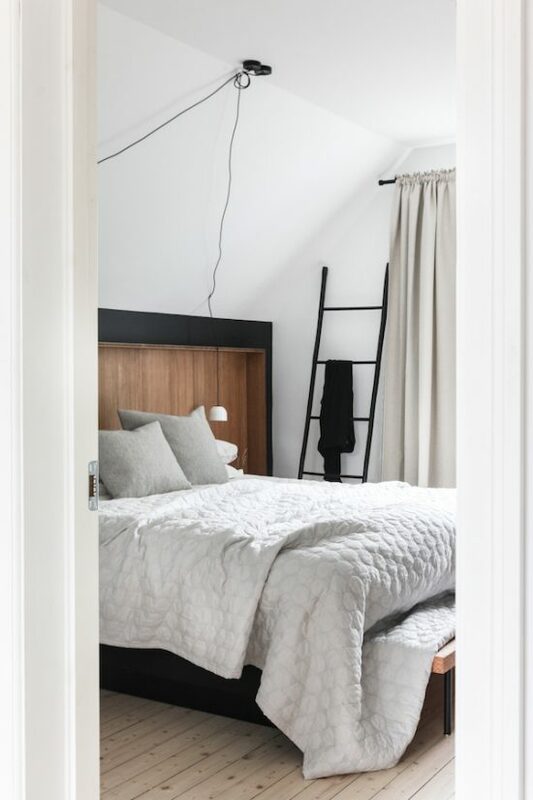 Ceiling-mounted ceramic pendants drape down on either side of the bed adding to the visual impact of the space. 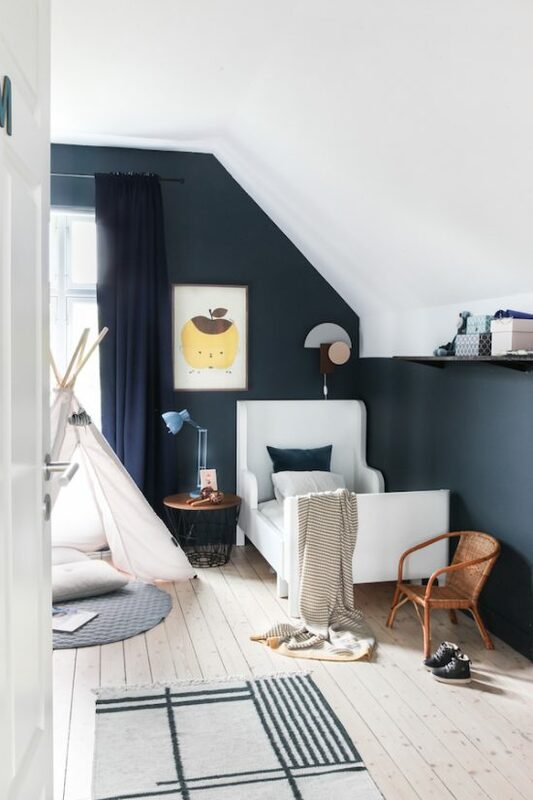 Next door, the couple’s son Vilmer enjoyes an equally cosy space, featuring rich blue walls, and ice blue painted vintage bed and accessories from Ferm Living and Fine Little Day. 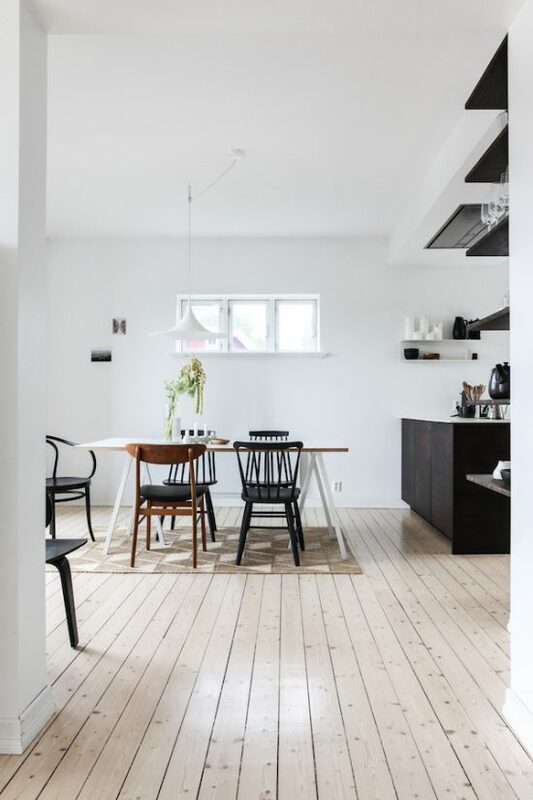 “The most joyful part of designing our interior has been, for us, the idea of creating a home for our family. 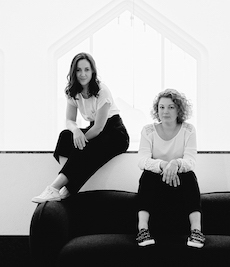 A place where we all feel relaxed, comfortable and united.” We couldn’t agree more. 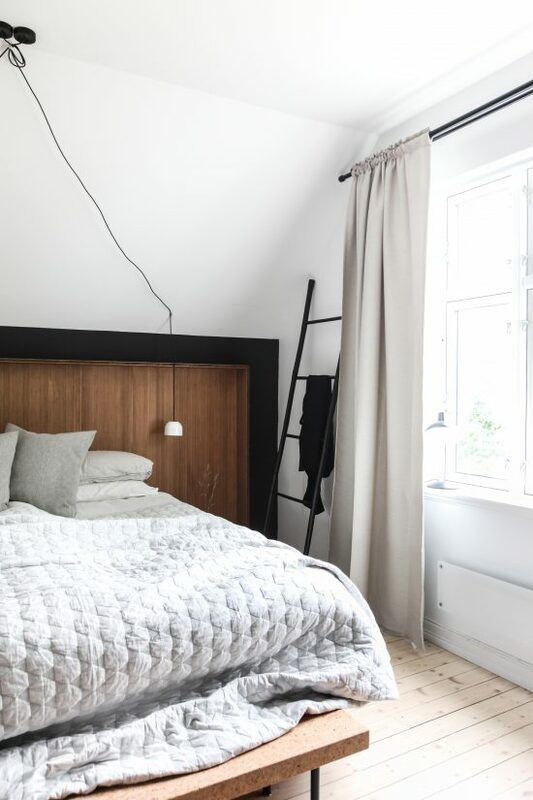 Thank you so much Kine and Kristoffer for opening up your home to us and so graciously allowing us to document each room. 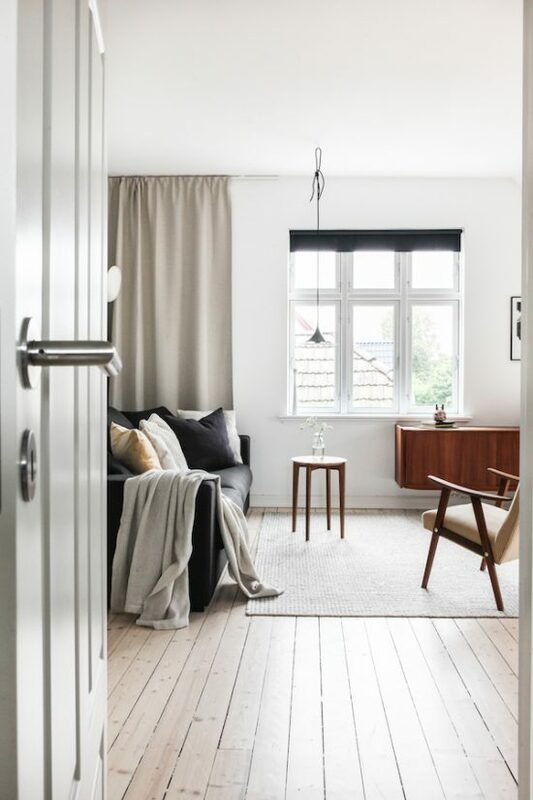 We love the calm, tranquil haven you have created for your little family! Did you guys enjoy this tour? 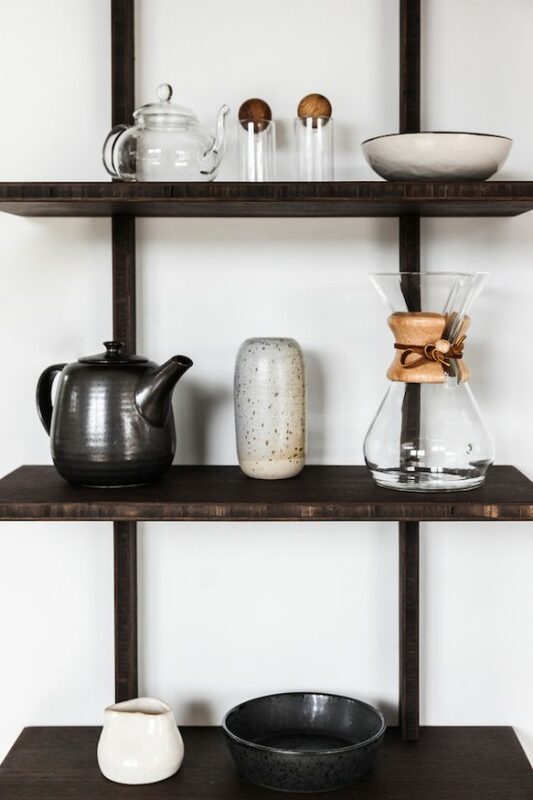 Make sure you pop over and see their beautiful studio tour too. To say we were inspired by our visit to these guys in Drammen is an understatement, they are doing beautiful things and it was a fabulous two days soaking it all up. What a beautiful home! 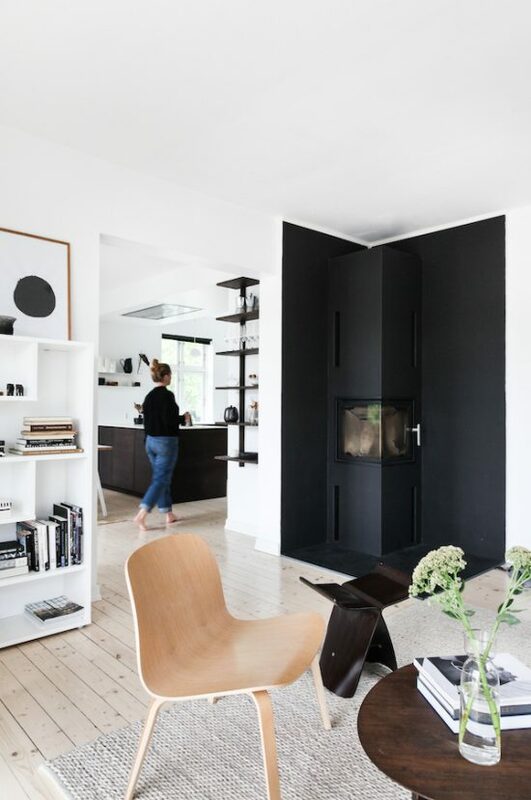 I love the mix of monochrome and warmer wood. Just stunning! So great to see the whole house – so beautiful. 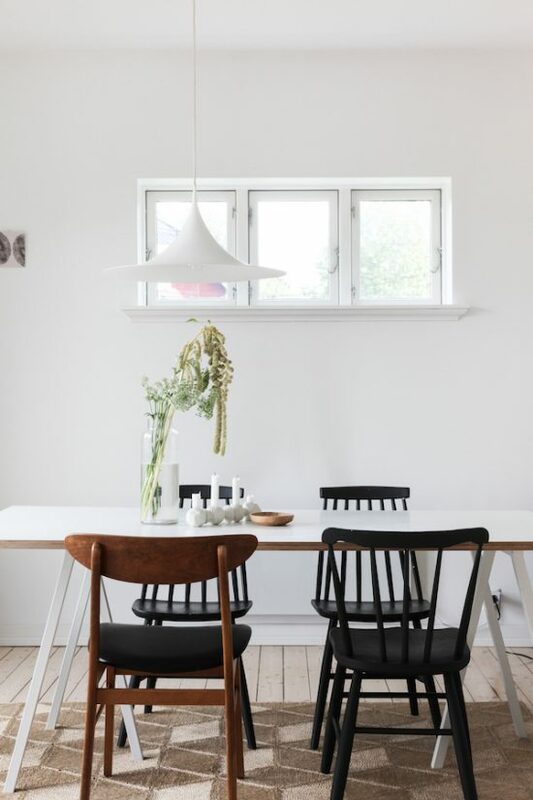 Love the simplicity which is warm but peaceful at the same time! 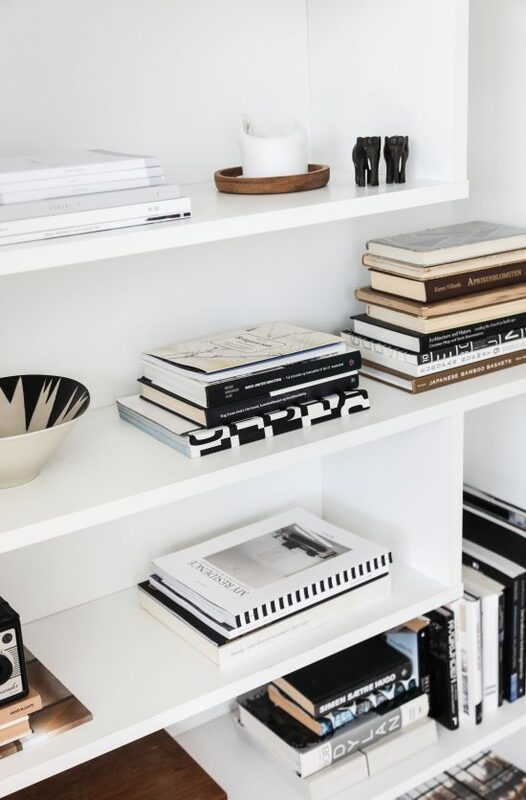 I got a lot of interior design ideas just from the photos! Thanks! What a beauty! Lives and breathes slow living lifestyle! 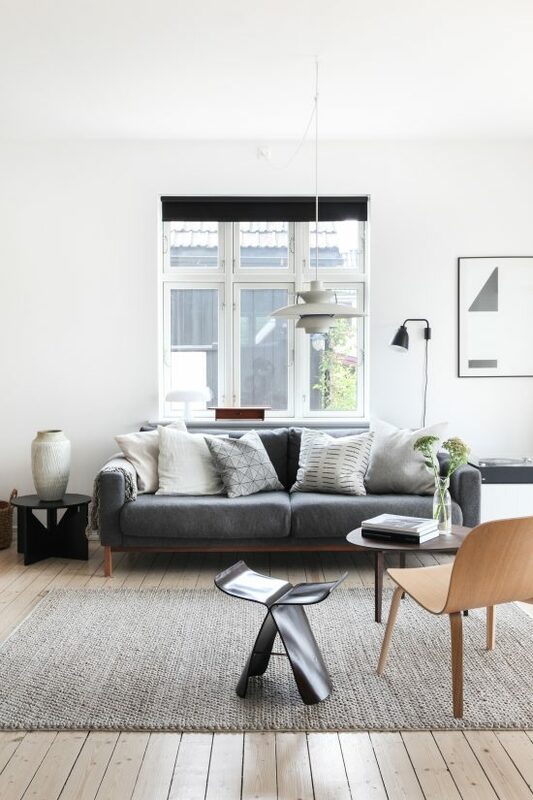 I love this home, so warm and inviting, but yet stylish. 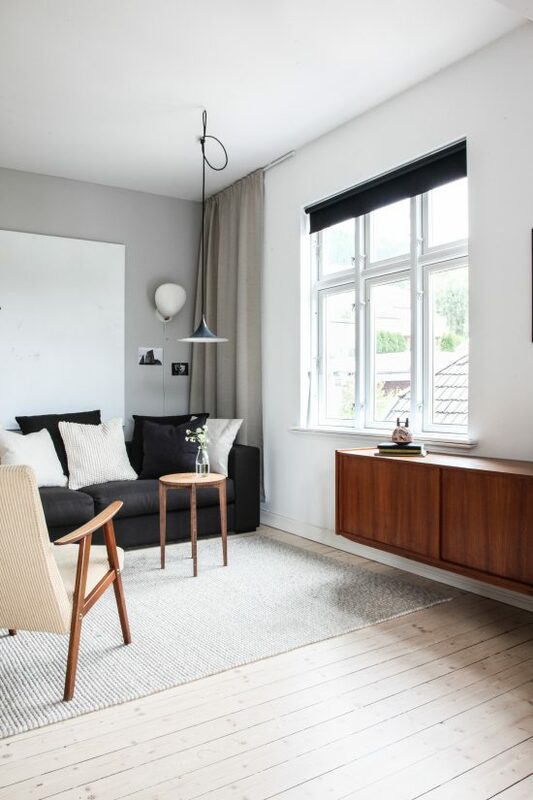 Plus, they have the same teak sideboard as me, the one shown in the last photo of the living room. Mine is an inheritance, never seen another one so very happy to see this one! 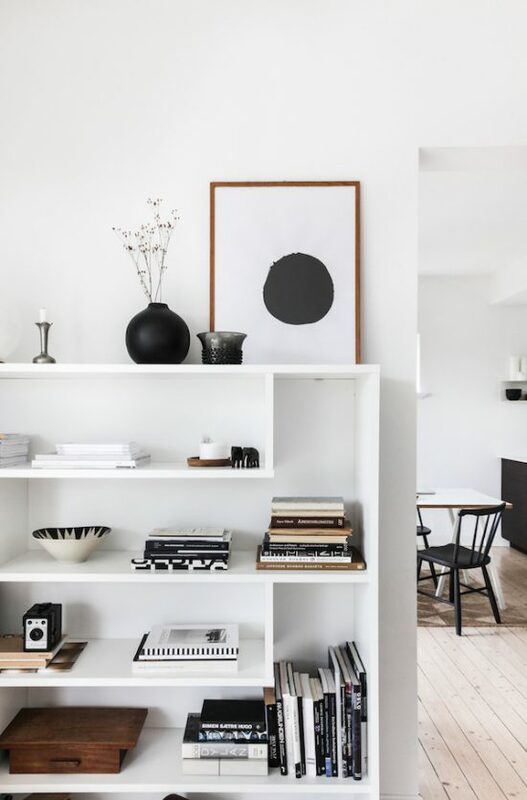 Love how they have hung it on the wall. 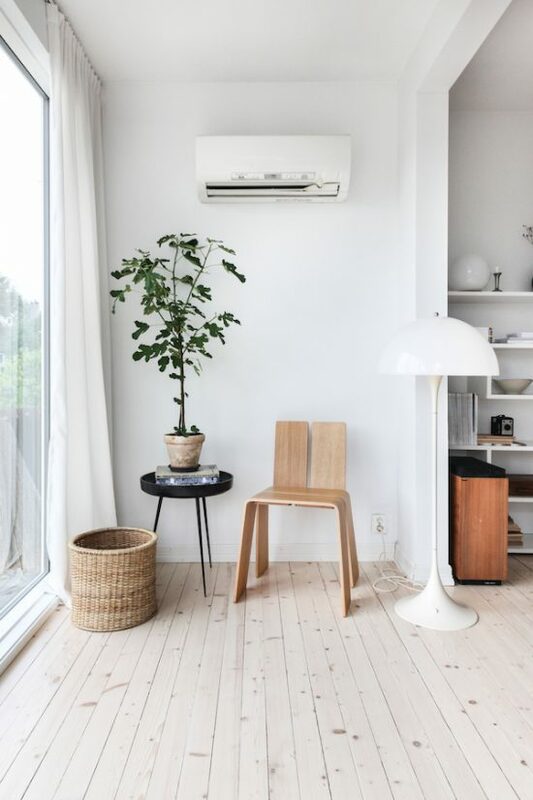 I am a big fan of nordic interior design – however I always feel like it could use a little more green! Looking forward to more articles like this. 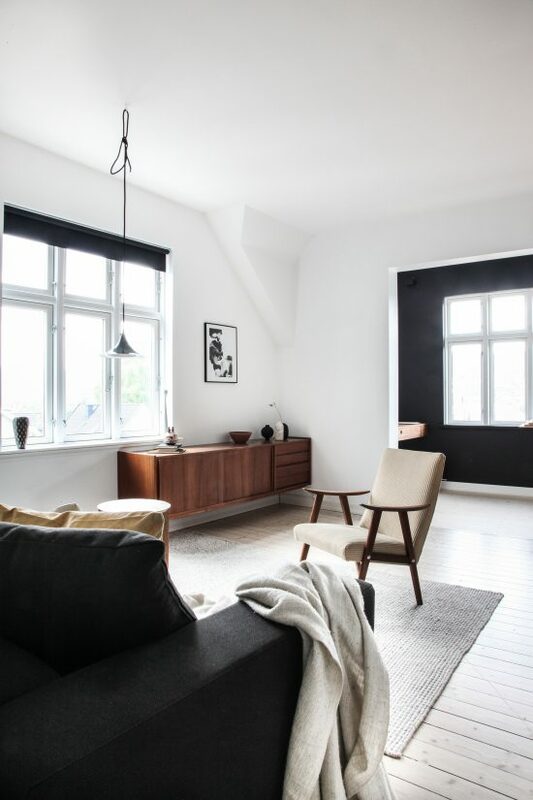 Really like the contrast between light and dark colors. It’s a really nice home as well.